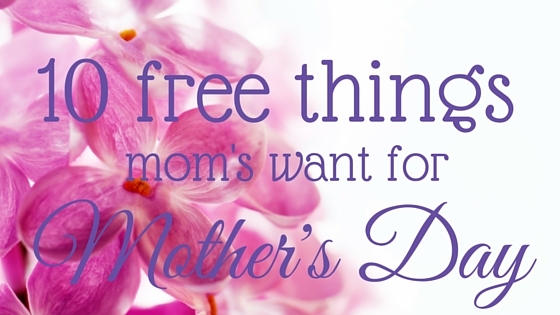 10 free things moms want for Mother's Day that she will love. Mother’s Day is right around the corner and it’s time to figure out how to celebrate her! Of all the things you could buy mom this year, the say that the best gifts come from the heart. Giving her something that is truly going to make an impact and allow her to enjoy her special day, is the best gift of all! If you need ideas for that special woman in your life, here are 10 free things mom wants on Mother’s Day. Unsure what would make mom the happiest this year? Here’s a list of 10 free and awesome ideas Mother’s Day Ideas to help you out! Make Her Breakfast: You know what mom likes best, so why not make it for her this Mother’s Day? Whip up some eggs, bacon, pancakes, whatever your mom likes to eat, but probably never takes the time to make for herself! Do the Dishes: No mother in her right mind wants to do the dishes, let alone on her special day! So, roll up your sleeves and keep her kitchen nice and tidy. It’s guaranteed she’ll appreciate it with all her heart. Fold the Laundry: One of the daily chores most moms have to do is the laundry. Why not fold some for her, so it’s one less thing she has to think about? The less she has to worry, the more likely she is to enjoy her day. Give Mom Some Quiet Time: As much as your mom loves you, one of the most precious commodities a mother rarely gets is some much needed quiet time. Try to plan something that will get everyone out of the house and give her some peace and quiet to do whatever she wants! Granted, a lot of moms may take that time to catch up on things around the house, but it’s nice to be able to do that without chaos going on around her. Leave Notes of Gratitude For Her: Moms all around the world love to know that their hard work and sacrifice is noticed and appreciated. Try setting some handwritten notes of gratitude around the house on Mother’s Day. Place them in areas you know she goes all the time, like the kitchen, bathroom, etc. That way, you can let her know how much you love her all throughout the day! Let Mom Pick What to Watch: It may not be what you want to watch, but if you have TV. time in your home, why not let mom pick the program? It’s a small gesture, but one she will probably appreciate a lot. So, instead of everyone else fighting over what to watch let mom do the picking on Mother’s Day! Write Yourself Reminders: Your mom may need to remind you constantly each day of what need to be done. Take a shower, clean your room, take out the trash – you get the idea! How about you, for at least this one day, write yourself reminders so she doesn’t have to do it. It would be a huge load off of her shoulders! Let Her Sleep: Oh, sleep. That elusive thought to be a myth, wonderful, wonderful sleep! Why not give her a little bit of that for Mother’s Day? Let her sleep in, or take a nap if she wants! It’s definitely something most mothers don’t get enough of, and it doesn’t cost a dime. Keep the Peace: No bickering, no tattle-tailing, no hair pulling, none of that. Give your mom the gift of keeping the peace for this one out of 365 days this year. She may check on the kids a few times because she’ll probably worry that someone is dead or destroying things, but she’ll come around and realize it’s just a way of showing her how much you care! Moms are pretty simple creatures when it comes to things they truly want. It doesn’t always take spending money to make her happy. Show your mom you care by giving her some of these free things that will make this Mother’s Day the best day ever! How are you planning on spoiling your mom this Mother’s Day? « Apple Pie mason jar oatmeal- a busy mom’s dream! YES to all of these! It definitely doesn’t cost a lot of money to make a mom happy on Mother’s Day. Keep the peace is my favorite! I’ve been a mother for 15 years and for at least 13 of those years, this has been all I have asked for. The kids asked me just yesterday what I wanted this year and when I told them, I got major eye rolls! LOL! omg yes times 10 please this is the perfect mom lust and spot on ! Definitely sharing this with the husband. Oh I’d take a ‘no dishes” day or someone else doing laundry!!! Seriously these little jobs just add up and before you know it you just spend the day cleaning up after others! Those are some great ideas….and as a Mom I know lots of other Moms that would appreciate them. Sometimes these little gifts are much more enjoyed than ones bought at the store!! This is a great list of things that can be done for Mother’s Day. They are very simple but so nice and thoughtful. I am now mostly an empty nester – one boy lives on his own and the other is in college – and I remember those days. Today, I would have an entirely different list that I will probably publish on my blog. Yup I need to share this so my husband sees. This is totally all I want for mothers day. A little help around the house, would be so appreciated! Nice to know from a guy’s perspective that you can make your wife’s Mothers Day without spending a bunch of money. My wife is notoriously difficult to shop for. My kids and I will take your suggestions to heart this year. Happy Mother Day to all the moms reading through these comments. This is just so sweet. Now we know that more than any material things, our service can be a great gift to all the moms all around the world. After all, actions are louder than any other material things. Happy Mother’s day. “write yourself reminders”. YES YES YES! Just a day of not constantly reminding everyone about everything would be so relaxing! Come hither, children! This nice lady wrote you a schedule for the day. THIS is certainly the perfect mothers day!! This is such a great list. i would be happy with any of these but especially the sleep one! oh yes please! I am a single mom, so honestly, all I want for Mother’s Day is for it to be acknowledged. My son is 5 and is homeschooled, so I NEVER get anything. I’m not upset because he is still really young and it’s not like he looks at the calendar to see what is coming up, lol. But I do look forward to when I actually get something on that day – even if it’s something like breakfast in bed. I used to think if someone besides me did the dishes I would faint. That’s a good one to have on the list!